Like a number of his cult classic films, John Carpenter's Big Trouble in Little China is more appreciated today than it was when it released. In 1986, the film was panned by critics and was an overwhelming box office failure. Fortunately, its particular brand of self-aware humor, combined with distinct design choices have helped the Kurt Russell-led action/adventure to find a new life in retrospect. To celebrate the life of the franchise, publisher BOOM! 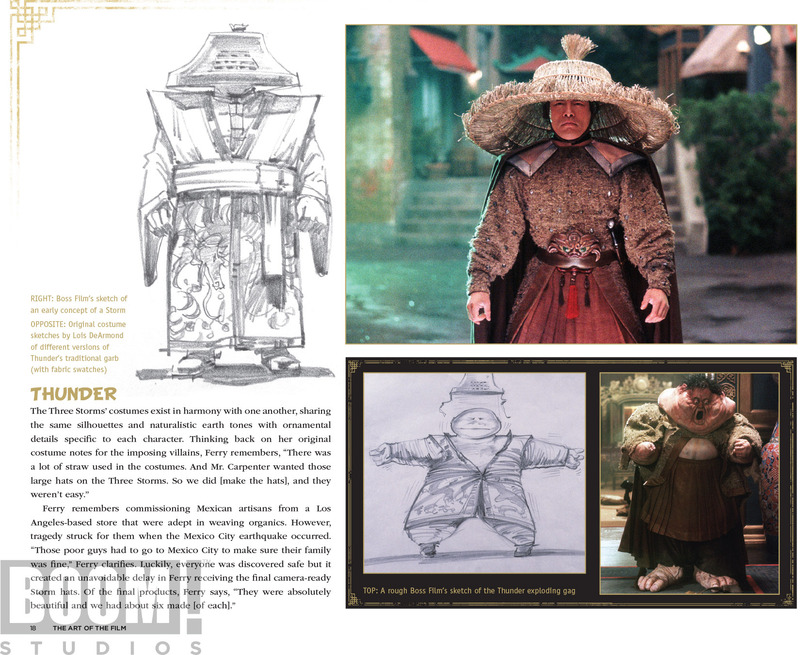 Studios is releasing a hardcover collector's book - The Official Art of Big Trouble in Little China. Billed by its publishers as "the first-ever look at the artistic world behind the beloved movie and its expanded universe," the book features art from the creation of the original film, all the way through its current life in comics and collectibles. The price is set for $39.99 and includes 176 full-color pages. Courtesy of BOOM! Studios, Screen Rant is pleased to present a first look at five exclusive pages from the book. The pages show off the film's costume design, storyboards, cinematography, advertising, and comic book stylings. Packed with never-before-seen images, including costume designs by Oscar nominee April Ferry; original set designs by Production Designer John J. Lloyd; original storyboard art by George Jensen; and development art from Funko’s “Big Trouble” series. Exclusive new interviews with Cinematographer Dean Cundey, Visual Effects Producer Richard Edlund, Special Makeup Effects artist Steve Johnson, and with artist Drew Struzan and a look at his early pencils for the iconic film poster. Exclusive Big Trouble in Little China comic book concept art and new interviews with artists Eric Powell, Rob Guillory, Jenny Frison, Adam Hughes, and many more. Exclusive Mondo cover and concept art and new interviews with Mondo's Jay Shaw and Oliver Barratt.